It's another urgent call to protect Syria's irreplaceable historical sites amidst the fog of war, loss of life and limb, and steady drumbeat of outside intervention. 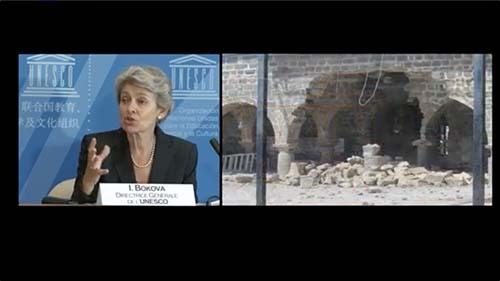 "UNESCO is determined to use its expertise and its networks to help the Syrian people preserve their exceptional cultural heritage," said the organization's director general, Irina Bokova. "Protecting heritage is inseparable from protecting populations, because heritage enshrines a people's values and identities." It's not the first time Bokova has called on all parties involved in the two-and-a-half-year conflict in Syria to safeguard the country's treasures. "I urge all parties to take all necessary precautions to stop the destruction of Syria's cultural heritage, which includes some of the most precious in the world," she said. "There is no culture without people; and no society without culture." Her appeal followed a meeting of experts held at the United Nations Education, Scientific and Cultural Organization's Paris headquarters to examine an action plan aimed at preventing further losses and repairing damage where and when possible. 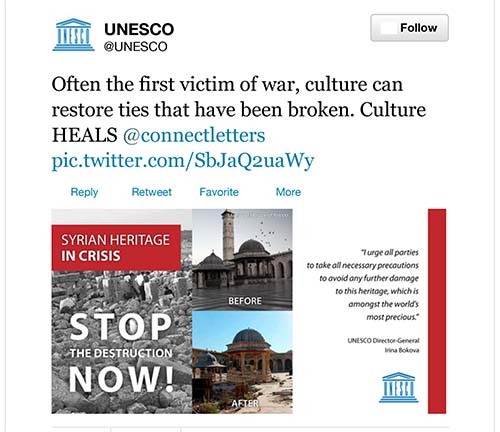 In a tweet focused on the "Syrian Heritage in Crisis," UNESCO said: "Often the first victim of war, culture can restore ties that have been broken. Culture heals." 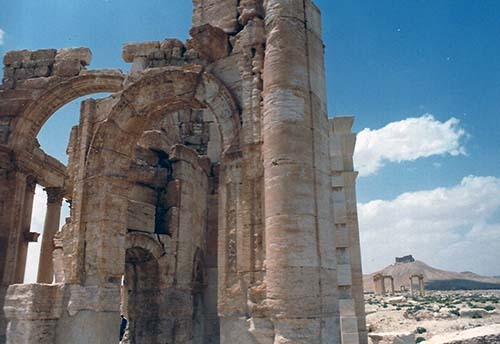 UNESCO has been raising awareness about the status of Syria's heritage, notably the country's six World Heritage sites, important archaeological sites, and moveable heritage, including museums and other collections. Preservationists believe treasures have been looted during the conflict. 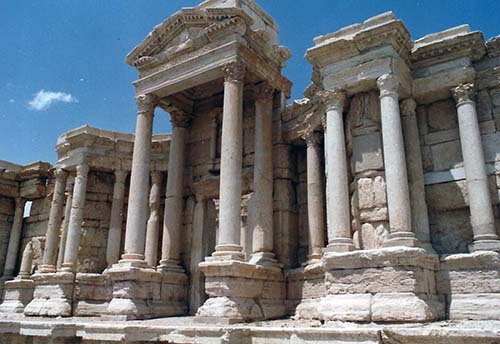 Among those heritage sites is the ancient metropolis of Palmyra (Tadmor in Arabic), or Bride of the Desert, 230 kilometers (143 miles) from the capital Damascus. It is an entire city whose remains have attested through the centuries to its builders' and former residents' greatness. Years ago, a true flavor of the place could best be savored by taking a local bus for a bumpy five-hour ride from Damascus, winding through a long stretch of desert road into Syria's central plain, with an obligatory stop in the city of Homs. But amid the parched surroundings, a warm spring injected life into the area, leading archeologists and historians to believe that hunting communities lived there as far back as the Paleolithic Age, over 50,000 years ago. Further up the ladder, the earliest evidence of Palmyra's ancient history one could find an Assyrian tablet uncovered at Cappadocia (Anadolia), dating back to the 2nd Millennium B.C. Palmyra was also referred to in an Akkadian text, which tells of the Assyrian King Tiglath-Pilesser I, who went to Tadmor to fight the Arameans. In the early Roman period the Arabs almost equaled the number of Arameans. While the tribes settling around the town and nearby desert were Arab and their people spoke Arabic, they wrote in Aramaic, the language in which Jesus Christ is said to have preached. The name Tadmor is well known among Semitic people although its etimology remains obscure and the word has no derivatives in any existing Semitic languages. Tadmor was given the Latin name Palmyra (from palm trees) and was known by it throughout the Greek and Roman periods. Palmyra submitted to a Roman military governor until the Emperor Hadrian (117-138 A.D.) granted it the title of "free town," giving its residents the right to govern themselves and look after their own financial affairs. To honor the emperor, Palmyrenes called their city "Hadriana Palmyra." During the Islamic era, the Arab general Khaled Ibn Alwaleed laid siege to the town on his way back from a campaign in Iraq, to support the Islamic forces engaged along the Yarmouk River. When Palmyra's residents rebelled against the last Omayyad caliph Marwan II, the ruler laid yet another siege to the town, destroyed its outer walls, and slaughtered its inhabitants in A.D. 745. When the seat of the caliphate was transferred from Damascus to Baghdad at the beginning of the Abbasid period, Palmyra was neglected. Early in the 10th Century an earthquake destroyed most of its buildings, killing countless inhabitants. 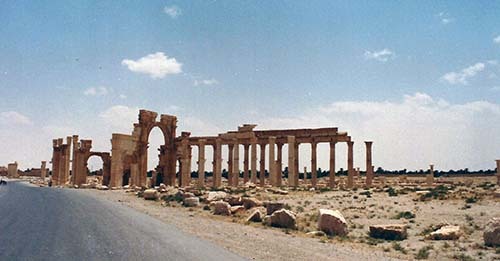 In the early 12th Century A.D., Palmyra's importance was on the upswing again when it fell into the hands of the Damascus sovereign Atabeg Tughtegin. Later in the century it was annexed by the emirs of Homs. The city's importance took another plunge when Tamerlane (Taimourlank) invaded and destroyed the northern cities of the Euphrates, which had strong trading relations with Palmyra. In the Ottoman period, Palmyra was completely neglected and only a passing comment in a book entitled "Selim Nameh" refers to Sultan Selim the Conquerer who followed its desert route and passed by it in 1514. It was left isolated during the reign of the Ottoman sultans, in poverty and illiteracy, under the mercy of bedouins to be pillaged and blackmailed. The earliest known expeditions unveiling the splendors of the city were those of Englishmen who in 1753 brought back beautiful drawings that were published in "Ruins of Palmyra." Standing 450 meters (1,476 feet) above sea level, modern-day Palmyra remains the subject of interest and historical excavations where its residents have engaged primarily in farming and trade. Amid the ruins of the ancient metropolis, a visitor could see a temple, an almost perfect amphitheater which was uncovered in 1952 under heaps of sand, an imposing arch of triumph with requisite road leading through it, a senate building, a banquet hall, a funerary temple and seemingly endless rows of columns representing once-noted buildings. Today's conflict in Syria is threatening what's left of these priceless relics.